In a skillet cook the beef (add adobo, oregano , cumin and salt). On another pot saute the sauce, pepper, seasoning, the alcaparrados, onion, garlic with a little olive oil for about 2 minutes. Then add the meat and cook at low heat until cooked . Fry in a skillet the ripe plantains. Reemenber that the more ripe bananas are the best the pastelón will taste . Mix 3 eggs and season to taste with adobo then place them on the mold. 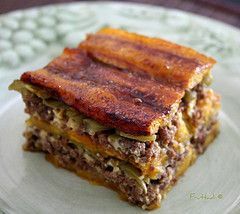 Cover with a layer of ripe plantains, one cheese, one ground beef, cheese later, bananas and last three huevos. Cook in the oven for 25 minutes at 350 degrees or until eggs are cooked. Recipe sent by Baltimore. Enjoy !!! Especially if you have a Pastelon 6 recipe.